Beautiful beaches, ideal wind conditions and charming towns make sailing in the Sporades an absolute delight. 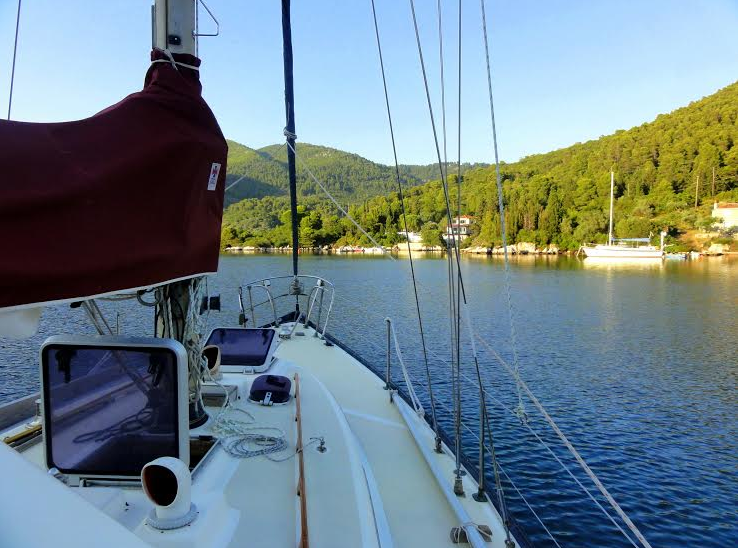 If planning a sailing holiday in the Sporades, make sure to check out our guest blogger Georgina’s tips and suggestions. 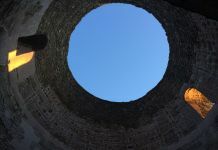 Read on to learn more about sailing in the Sporades and don’t forget to keep up-to-date on Georgina’s whereabouts as she continues to sail around the stunning islands of Greece on her blog. 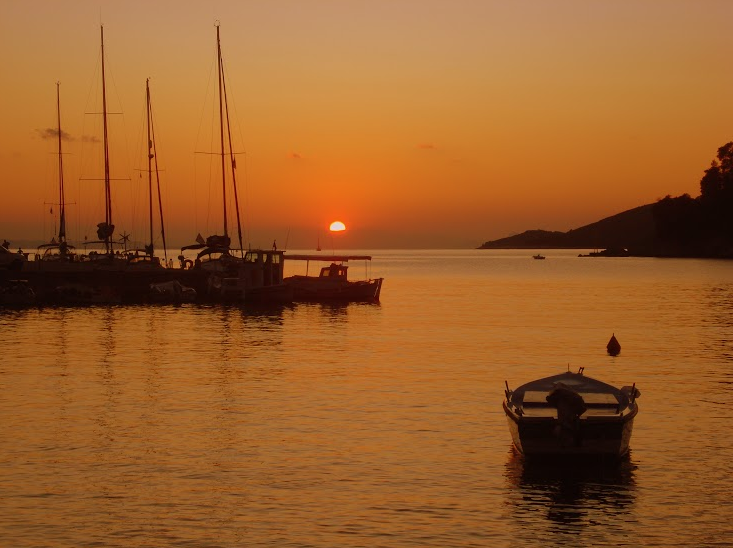 One memorable sailing trip which we very much enjoyed a few years ago, started from Skiathos. 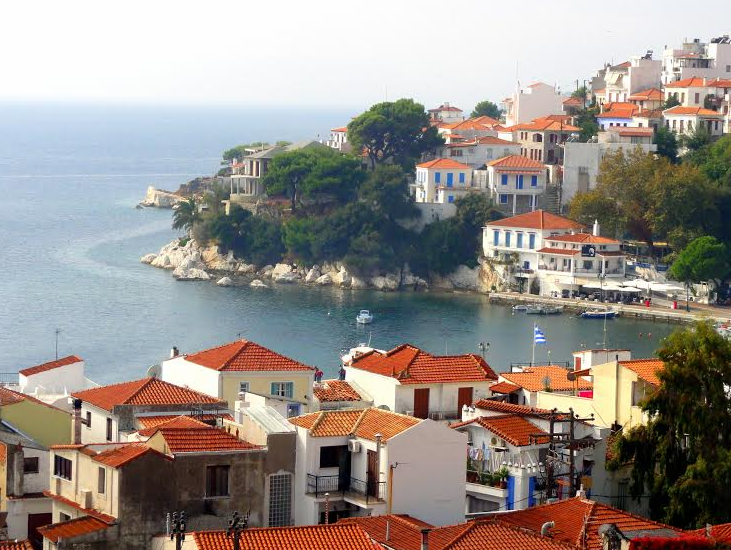 Along with Skopelos and Alonnisos, these islands are part of the Sporades group, which are very close to the Greek mainland at Magnesia, and also the nearby island of Evia. We made this trip in late October, and were exceptionally lucky with the weather. The Meltemi winds had largely subsided, allowing for some pleasant sailing. We were also lucky enough to swim in the sea at this time of year, which was warm, and crystal clear. After leaving Skiathos behind, we made the short trip of 7nm heading east to the island of Skopelos and moored stern-to in the harbour at Loutraki. Above the port, is the pretty hill town of Glossa, which retains an authentic rural Greek feel, and some spectacular views. It was a 30 minute walk up a winding hill road (or you can take the bus) where most of the island’s almond trees grow. The next day we headed south from Loutraki and anchored in the lovely sheltered bay at Panormos, for a lunch stop. The enchanting book Gates of the Wind by Michael Carroll, is recommended for its rich descriptions of the Sporades islands, and their people, during the 1960s. Michael Carroll’s house, which he describes in his book, is easily visible on the eastern shore of the bay. 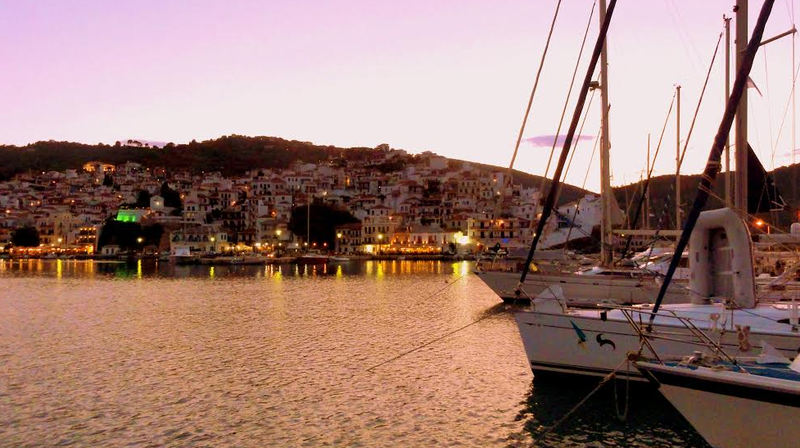 That evening, we arrived in the harbour at Skopelos town. Being on the northern exposed coast of the island, it is very important to check the forecast first, as a prolonged Meltemi wind will kick up dangerous seas in the harbour entrance. Also, many large ferries and hydrofoils use this port, making it a very busy place. As the big car ferry docks, it makes a manoeuvre bringing it very close to the yachts moored on the north quay, causing quite a wash.
Skopelos town is very pretty, forming a steep ampitheatre of white buildings and terracotta roofs around the harbour. There are said to be over 130 churches here, and I remember being able to count at least five, from where I was standing at one junction of narrow streets. 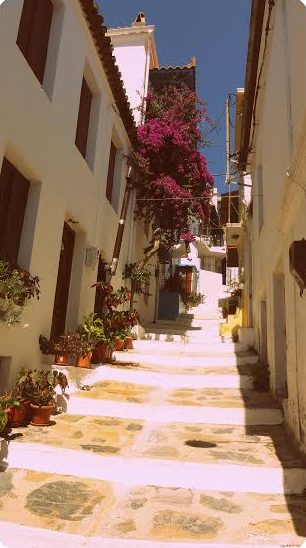 Back down in the harbour, Skopelos has a more peaceful and up-market feel than its brash neighbour, Skiathos. The next morning, we woke to clear blue skies and a light northerly breeze. 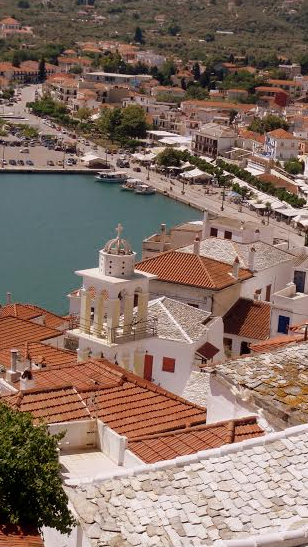 We sailed east, around the southern tip of Alonnisos and into the harbour at the main town of Patatiri. We chose to anchor in the bay, and secured our stern lines ashore. We took the dinghy into town to explore. Patatiri is another town in the Sporades that has a hill village, or chora. Most of the buildings were completely destroyed by the 1965 earthquake and the village became deserted. But since this time, most of the properties have been beautifully restored, and the hill village has been brought back to life. You can find many quaint craft workshops, boutiques and tavernas, and also experience the amazing views over Alonnisos and the surrounding islands. The next morning we had an excellent sail with a northerly force 4 wind, taking us 5 miles north-east to the small harbour of Steni Vala. The inlet is used by local fishermen, who are remarkably tolerant of visiting yachts. Water is available on the quay. There is a mini-market, and several excellent tavernas, serving traditional, home-cooked Greek food. After a lovely evening meal, I thanked the cook and told her that the oven-cooked lamb dish I had chosen was excellent, and one of the best meals I’d had. With a smug look on her face, she triumphantly told me – “it was not lamb, it was goat!” Luckily I didn’t mind. Goat or lamb, it was still delicious! The next day, we sailed south-west back to Skopelos, and arrived in the largely under-developed and unspoiled bay at Agnondas, on the west coast. There is plenty of room for yachts on the concrete quay, which was built as an alternative port for the island’s ferries, if the harbour in Skopelos town is untenable. The beach, with a few tavernas nearby, is surrounded by pine forest, and makes an excellent spot to watch the stunning Greek sunsets. Before ending our trip back at Skiathos, we spent the next morning at anchor in the turquoise blue shallow waters off Floros beach on Tsoungria island. 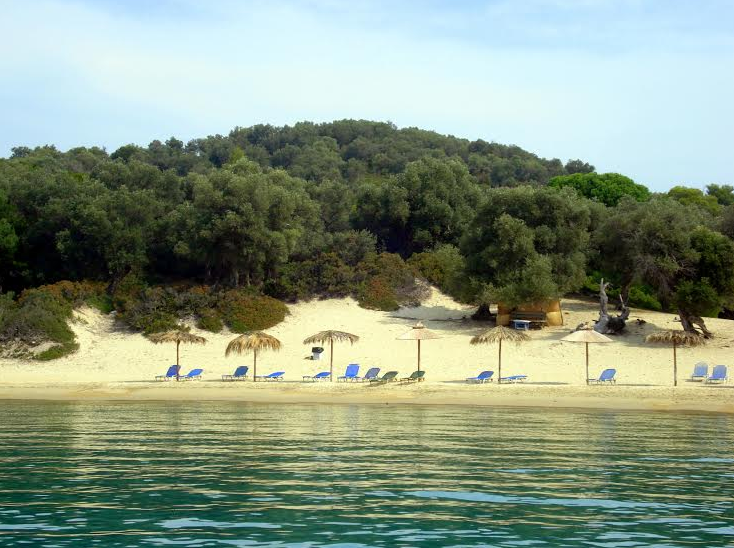 The island is just two miles directly south of Skiathos town. On the west coast we found an excellent spot for a swim, as the bottom is sandy and the beach shelves very gradually. This small island has no permanent inhabitants. There is a beach cafe, but this wasn’t open when we were there in late October. 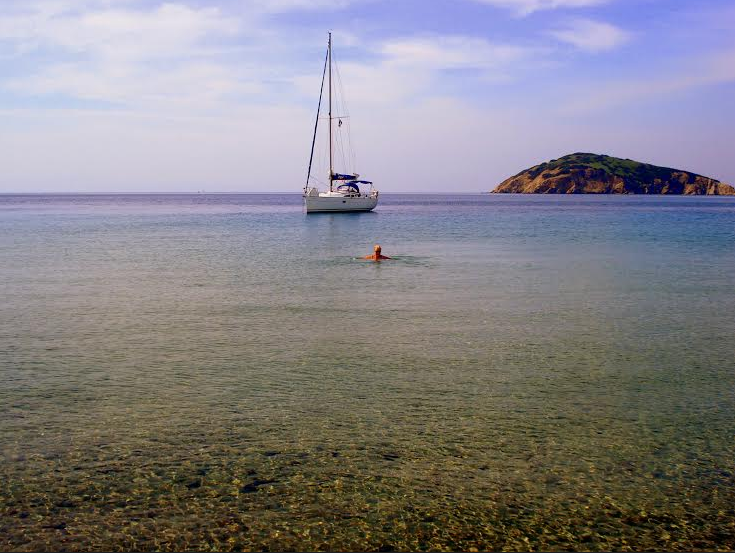 Swimming in the beautiful warm water, then being the only people on the beach, was a fantastic way to end our sailing trip to the Sporades. 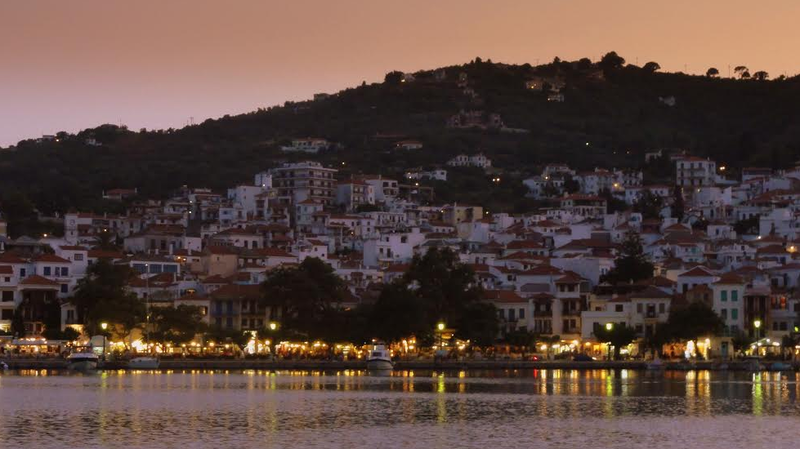 Begin your journey in the Sporades aboard one of our boats departing from Skiathos. Contact our Zizoo team for more info.